Rhys Griffiths has committed himself to staying with Llanelli after signing a new two-year deal with the Welsh Premier League title-chasers. The striker, who tops the Welsh Premier scoring charts this season with 25, had a trial with Swiss side FC Aarau recently but is staying with Llanelli. Griffiths, a professional firefighter, has also previously attracted interest from League Two side Wrexham. 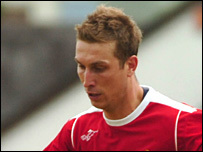 He has also played for Haverfordwest, Cwmbran, Carmarthen and Port Talbot. Griffiths celebrated his new contract with a hat-trick in the 4-1 New Year's Day win over Carmarthen that kept Llanelli two points behind league leaders The New Saints.